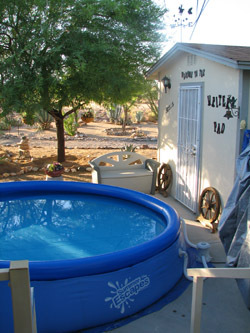 You are here: Home / Blog / Silver Gypsy: Cool Pool Now; Cesspool later! Well, the hot weather is here, most people have left for cooler climes, and life is a little tedious. So now what? Well, first you buy a pool and spend a fair amount of time wondering why you put all the five major leafy trees, gardens surrounded by rocks, and five huge boulders on a 50’ X 70’ RV lot along with a park model, Arizona room, and shed/office. Next, you wedge the 12’ in diameter, 30” high pool between your office and park model in the only open area on the most level piece of cement you have. Then you discover that nowhere does it recommend that you have at least two people to put it up, one of which should be about half your age with a strong back. Then you lay down the underlying tarp, and get the pool arranged with the big blue ring in its proper place to be blown up. Nowhere does it say you need some kind of pump to blow up this key component to having sides and a top to this pool. Nowhere does it say that you need common sense to construct anything, let alone this big blue plastic, and at the moment deflated Lake Michigan, that is now out of the bag and ready to be dealt with and you couldn’t get it back in the box and return it if your life depended on it. Nobody ever accused me of having common sense. Now is the time to put together all those little white plastic components that will become the filter. I must have forgotten that I do not do directions well. The one thing I did right was put the pool down with the plug-in parts closest to the 3-prong electric plug by which I will probably eventually electrocute myself. Enter kind friend, Jim Kimmins, who is always willing to lend a hand to a distressed neighbor at the other end of a frantic phone call. I kept very quiet because I didn’t have anything constructive to add and I know that most guys when confronted with putting things together, do not need help, especially mine. He put all those little plastic pieces together, even remembering to put Vaseline on the little O-rings. Everything in place, add the required one inch of water and start blowing up the blue ring. Although I have been told I am full of hot air, I didn’t realize that wouldn’t help me blow up that huge blue ring. I blew and I blew and I blew until I was blue and the huge blue ring was nowhere full. Jim had already left to find a pump and bless him, he brought one. By the time there were two inches covering the pool floor, I knew that the cement and part of the walkway the pool was on, was not level. So, I soldiered on anyway, stretching the bottom to rest smoothly. Didn’t happen, but it was smooth enough for me. Jim’s pump filled the blue ring and I sent him on his way with a grateful heart. So, when the Arizona is hot enough to fry eggs on my driveway (nearly every day now), I am climbing into a cool pool that is slightly lopsided but I’ll think about that tomorrow. And, the mystery of pool chemicals, vacuums, nets, algae, etc is really beyond me. It does not say, if the Ph is high, add two teaspoons of chorine or if the Alkalinity is low, add 4 tablespoons of something else. And at the same time that I gripe about the heat, I remember that I am not dealing with floods, hurricanes, tornados, or major fires and all the problems the rest of the world is battling. God Bless until next week.